Kalamata Olive Bread at its best with a crispy crust, chewy crumb, and plenty of salty Kalamata olives is a lot easier to make than you might think. I do away with the “poolish” starter and simplify the steps to keep this do-able for the most inexperienced bread baker. This, y’all. Homemade kalamata olive bread is one of my very favorite breads to make, even though I don’t make it often for one simple reason… I am an addict to the core. I love olives so much and when you combine olives and carbs it creates a special kind of addiction that I almost can’t resist. And by almost I mean never. Ever. The crust on this is crackly crispy, like the bottom crust on a thin good, thin crust pizza – almost a cracker. 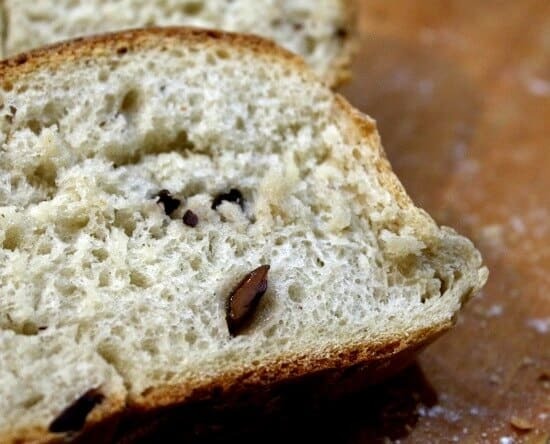 The crumb is soft and chewy but the star is the salty, cured olive flavor. This can be shaped like a baguette, in a round, or about any way you’d like it to be. It’s a good, stiff dough – you can even form it into sandwich rolls. Imagine grilled lemon chicken on a homemade Kalamata olive bread sandwich roll? It’s a weird thing about me but I tend to cook up a storm before I am leaving to go somewhere. For example, I flew out to Jacksonville, Fla last Sunday at 5 AM with my daughter. We were going to stay overnight on Amelia Island and drive my son’s car back to Texas on Monday because he is deployed. (In case you have “known” me a long time and are confused about why an Air Force person would be in Jacksonville it’s simple. Number 3 son went into the Navy – so that’s 2 in the Air Force and 1 in the Navy at this point). So, I baked and cooked all day Saturday – you’d think that the family that remained in Texas was going to be without me for weeks instead of 48 hours. I feel in love with Amelia Island. It’s so pretty, and of course in February it was deserted — fine with me! I didn’t get to spend a lot of time on the beach but just enough to breathe and drop stress for awhile. The beach does that for me. I feel centered, calm, and unhampered when I am walking along, toes digging in the sand and the sound of the waves, the wind, and the gulls singing over me. I am going to write a bit more about it…hopefully tomorrow. I’ll include the amazing hotel where I stayed and a review of the restaurant where we ate. I did not get pictures of the food but it really was fantastic. Here are some of the ingredients I used in the bread. These are affiliate links. If you click through and buy it helps support the blog. Thanks so much! 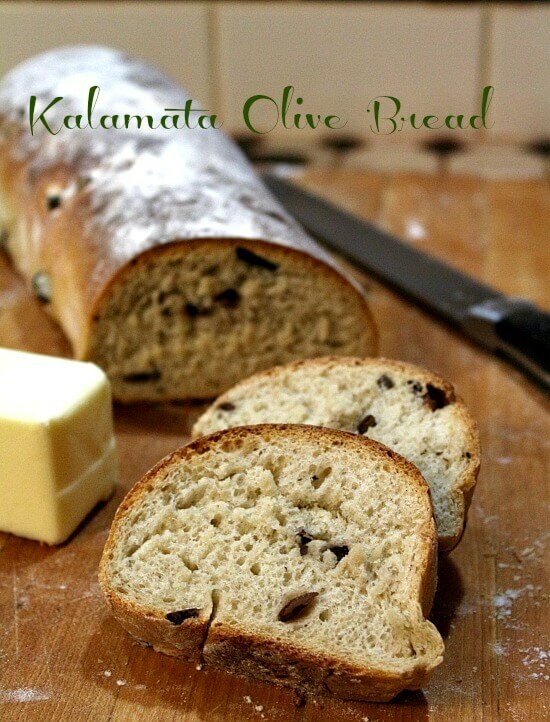 Flavorful Kalamata olive bread with a crispy crust and a chewy crumb just can't be beat. Serve along side your favorite pasta dishes or use as sandwich rolls. Combine the water, sugar, and yeast. Stir to dissolve the yeast fully. Add 1 cup of the flour and mix on low speed until well blended. Add the brine and salt -- blend well. Add the gluten and the olive -- set the mixer to medium speed. Slowly add the remaining flour until the dough "cleans" the sides of the bowl. Knead for about 8 minutes by mixer or 15 minutes by hand. Remove the dough from the mixing bowl. Roll each piece of dough into a boule, or a baguette. Place the dough on the counter and cover with a warm, damp cloth. Let rise for 30 minutes. Preheat the oven to 500° F.
Score the loaves with a sharp knife. Just as you put the loaves in the oven pour about 1.4 cup of water on the floor of the oven to create steam. Keep door closed. Bake 10 minutes then reduce the heat to 400° F and bake about 20 to 30 minutes longer. Loaves will sound hollow when tapped. Remove the bread from the oven and cool for at least 30 minutes, or as long as you can wait. Can you taste the ginger? No, it’s just a tiny bit to help the yeast grow. Yay! I am glad you like it – thanks for buying the book!! 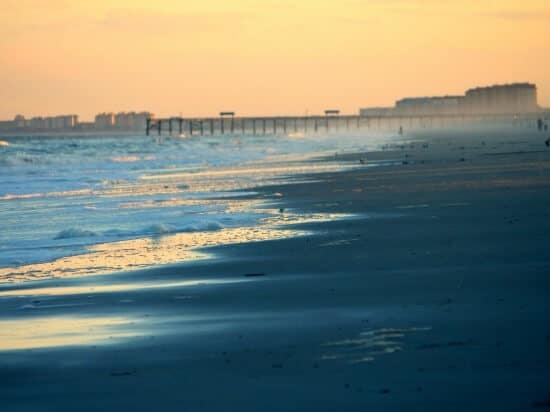 Amelia Island sounds like a wonderful place! You must be a very proud mum to have all of your boys serving the country! And this bread…I’m thinking it would be great for a grilled veggie sandwich. Well… it’s 3 of them. I have 2 more boys (still kids) and then 3 girls…and I am proud of them, too! Amelia Island was amazing. 🙂 I hope to go back. What a perfectly gorgeous loaf of bread! I really miss bread-baking! I love baking bread! Thanks! I was thinking sandwiches, too, with this bread. Lovely photo of the beach. I felt calmer just looking at it. This bread looks like some that I’ve had in restaurants – I can’t wait to try making it at home. Yum!